Chiropractors have been caring for adults and children for more than 100 years. It is well-known in the scientific literature that many common ailments respond extremely well to this safe, natural form of health care. In recent years more and more parents, especially those who have been treated themselves with chiropractic care are seeking chiropractic care for their children. This week’s FaceBook article attempts to answer some of the frequently asked questions asked by parents about their children’s health. What is chiropractic? Chiropractic is based on the important relationship between the spine and the nervous system. One of the most basic ideas in chiropractic is that dysfunction in the spine and its joints can lead to dysfunction within the nervous system and since the nervous system controls and coordinates all the systems of the body, spinal dysfunction can have wide ranging effects on the body’s health. As Chiropractors we are trained to evaluate how the body is functioning as related to the spine and treat areas of dysfunction. Why do my kids need chiropractic? A child encounters many physical stresses during their growing years. The resulting problems in children’s spines can occur at almost any point in their development and growth. 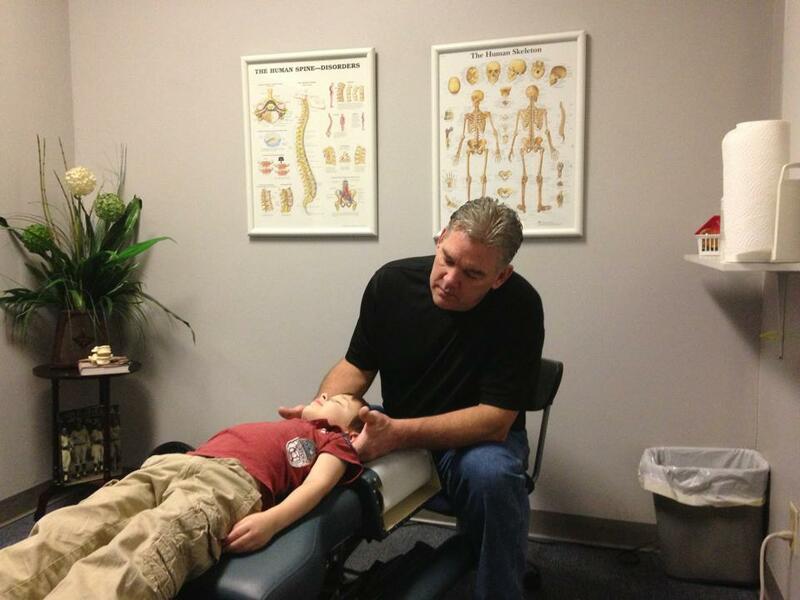 Dr. Mark examining 5 year old Trevor's cervical spine after school last week. The earliest challenge a growing spine faces is the position it is forced to adopt in utero, there are many fetal positions that can cause problems with labor and delivery, some are: brow, breech, transverse, posterior and ascynclitic. What is less well known is that these fetal positions can also cause problems in the baby’s spine as well. Spinal segments can lose functional activity or motion, often times are pushed or jammed out of place which can jeopardize the health of your child. Additionally birthing methods can stress an infant’s spine and nervous system not to mention interventions such as induction, forceps, vonteuse suction, or caesarean section. The cause of many newborn health complaints such as colic, reflux, breastfeeding difficulties, sleep disturbances, allergic reactions, and chronic infections can often be traced to nervous system irritation caused or complicated by dysfunction within the spine. Since significant spinal trauma can occur at, or prior to birth, a recent trend for many parents is to have their newborn’s spine checked right after birth. Many developmental milestones such as learning to hold up the head, sitting upright, crawling, and walking are all activities that are affected by spinal dysfunction and are important times to have a child checked by a chiropractor. Additionally, falls, sports injuries, playground bumps, heavy school bags and sitting all day in the classroom are all physical stresses to the growing child. Next week we will discuss the scope and nature of chiropractic care including common childhood disorders, the examination process, the actual treatment procedures, safety concern, the “does it hurt” question and others. We all know that Stress plays a negative role in our lives and will impact on your health. Among other things it depresses your immune system, interrupts your sleep, and can cause you to overeat or make poor food choices. Fortunately, there are many ways to reduce stress in your live and in the lives of your family. Play and laugh! – Release the “HAPPY”..! Laughter causes the release of endorphins, those tiny neuro-chemicals in your brain. Long-distance runners call the release of endorphins “runners high”. This is an effective way to reduce stress immediately. Breathe deeply – Take several long and deep breaths through your nose. Notice how this makes you feel, and make it a daily practice. Communicate – Establish a support group among your family and friends. Eat healthy foods – What you eat affects how you think. Think of your stomach as your second brain. Think positively – Use your thoughts to reduce stress in your life. Train yourself to flip negative images and thoughts into a positive plan of action. Spend time with your kids! They do and say the funniest things, and just being around them can help you reduce stress. Play with a pet. Pets are known to lower their owners’ blood pressure and help reduce stress. Make time for fun activities that create laughter, like bowling or miniature golf. Make it a point to laugh at your self – everyday. Choose a computer screensaver that makes you laugh. Spend time with fun, playful people who find the humor in everyday events. Listen to a comedian on the radio or rent a DVD and watch it on your weekly “Family Night”. One of the most important keys to having a healthy attitude is to learn to be grateful. Here are some simple ways to incorporate a lifestyle of gratitude into your family. Always remember to set the example for the habits you want your kids to adopt. Say “Thank You” to everyone – even very young children. Be of service to others. Take the time to open the door for someone else or pick up trash when on a walk. Keep a journal. Remembering things to be thankful for doesn’t have to be reserved for Thanksgiving Day. Make a habit of saying something you are thankful for at mealtime each night or before going to bed. A gratitude journal from their childhood years would make a great present when your children grow up! Teach your children financial responsibility by involving them with decisions at the store. Show them how much money you have to spend that day and let them help you pick items that are within the budget. Cultivate a spirit of giving back through time and/or resources. Show them examples of others who aren’t as privileged as they are and provide your family opportunities to experience the joy of giving food, clothes, money, time, etc. to others in need. Teach kids to see good in someone they don’t like. By always looking for the good in others, kids will learn to be grateful for the little things in life. Simple thank you comments to all of your daily activities is the easiest way to role model appreciation that they will learn and emulate.